During February we celebrate Black History Month. So I wanted to share one of the great ironies of our country…the irony that so many blacks became Christians. Centuries ago, when slave-traders kidnapped men and women, boys and girls from Africa, these Africans were not Christians. They were kidnapped, sold, transported in the most horrendous circumstances across the ocean, sold again, beaten, tortured, threatened and killed with impunity…often by “Christians”. For the most part, slave owners in America did not want their slaves to become Christians…because Christianity taught the worth of each individual, freedom and dignity, and hope. Yet, many of these slaves began to believe in Jesus anyway. They began to gather and worship and have hope because of the amazing grace of Jesus and his offer of eternal life. These slaves became believers in Jesus despite the fact that their owners were not sharing Jesus with them and many did not want their slaves to believe. God works in amazing ways. But, this also gives me hope. If God can use slave owners to demonstrate the power of Jesus, surely he can use me too! In Mark 4:13-19, Jesus explains a parable he told earlier in the chapter about a sower who sows his seed. This sower sows the word of God. God is the sower…but so is anyone who is willing to share the good news of Jesus. God never gets tired of sharing his good news…even sharing with people who do not want to receive the love of Jesus. But, even for those who do want to follow Jesus and hear his words, it is not easy. Jesus says this is because we are in a spiritual battle involving demonic forces. 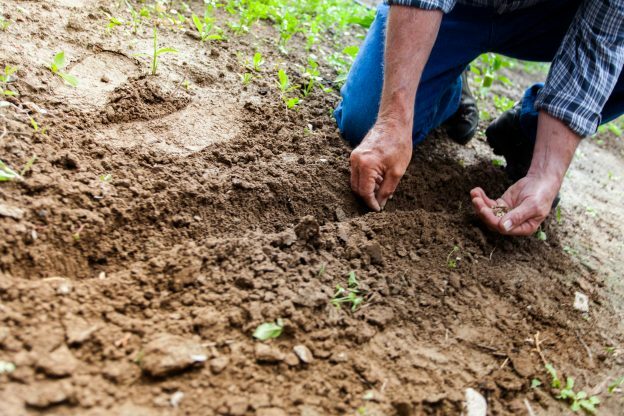 Jesus uses the example of soil to illustrate the different responses people have to hearing the word of God shared with them and how the evil one gets involved when God pours out his love on people. In v. 15 we see that when the word is sown to the first group of people (on the “path”), Satan comes immediately and takes away the word. In other words, Satan gets working! He is content to leave people alone as long as they are not actively receiving God’s Word. Satan loves nothing more than for people to be bored to death. But, when they become open to receiving God’s Word, boredom is no longer an option. Satan must now take action. The second group of people hear the word and receive it with joy (“rocky soil”). But, sadly, they have no root and fall away when trouble or persecution comes. This is not random. Satan brings trouble. Growing roots means getting deep with Jesus…spending time with God. The third group of people are compared to seed sown among thorns. They also receive the word, but have an incomplete view of God. They are distracted by worry, fear, temptation and lust. In short, they are not willing to trust God to be in charge of their lives. We live in a spiritual battle. God loves us…without us doing anything. Yet, we are afraid to let this God of love be in control of our lives. We trust ourselves more than God. It is totally understandable…yet doomed. The last group are the good soil. They hear the word, accept it and produce a crop. This is where many Christians get confused. Do we have to DO something to produce a crop…or simply be good soil? That is a tricky question, because the answer is we have to DO something…but that doing something is simply being good soil! GOD is the POWER. God is the one who draws people to Him. Yet, God uses us. God loves us so much he gives us the FREEDOM to use his power in whatever way we choose. We get to enjoy living for Jesus. God doesn’t tell us most of the time who to share with, how to love, when to love or where! But, Jesus tells us that if we are good soil, we will produce a crop. God never tells the church that they need to grow numerically! Yet, God says it is the inevitable result of being good soil. Today, God invites us not to stress. SIMPLIFY. God is looking for faithful people…but in the amazing love of God, he uses unfaithful ones too! This entry was posted in Blog on July 10, 2017 by admin.